In 1985, the world marveled when news spread that the sunken Titanic was discovered on the ocean floor. Until then, underwater exploration was nothing more than a pipe dream. Fast forward to 1989 in the Atlantic—the German battleship Bismarck was discovered by the same man! Who is this brilliant oceanographer? None other than Dr. Robert Ballard, a native of San Diego, CA, former United States Navy officer and professor of oceanography. Ballard catapulted to fame with the discovery of these two shipwrecks, and people wanted to know how it was possible to search uncharted territory under the sea. If you ask Robert Ballard, he will tell you he was born with a passion for studying the sea. He soaked up everything he could learn about oceanography in college and graduate school. Then, Ballard put his scientific skills to use as an officer in the U.S. Navy. This is where he gained access to one of the first manned submersibles. Consequently, Ballard was inspired to develop his own advanced deep-diving submersibles. Among them, the Argo was an unmanned deep-towed undersea video camera. The Argo had several cameras looking forward and down, as well as strobes and underwater lighting to illuminate the ocean floor. Thanks to visionaries like Robert Ballard, remote operated vehicles (ROVs) are so advanced today—they are used to locate sunken ships and aircraft—such as Malaysian Flight MH370. Ballard and his team of deep-sea explorers have located and examined dozens of noteworthy wrecks. They have also made scientific discoveries under the sea, (i.e. hydrothermal vents over the Mid-Atlantic Ridge). For extreme detectorists, what makes Robert Ballard such an important figure is his role in the development of underwater ROVs. The inception and technological advances made to ROVs make locating shipwrecks entirely possible today. They are also now available for personal use or for small salvage teams. ROVs were originally created for use by the Navy—not for locating underwater treasure. After Robert Ballard located the Titanic and Bismarck, only large commercial salvage operations could afford such a huge investment. Now, a mainstream, yet avid, underwater detectorist can actually get his hands on marine salvage equipment. Equipment available today includes -held and boat-towed metal detectors, marine magnetometers, underwater camera systems, Pingers and Receivers, ROVs, and side scan sonar. This is how dreams become reality! According to Sean Fisher, of Mel Fisher’s Treasures in Key West, the value of undiscovered shipwrecks and their cargoes can be estimated at somewhere around $60 billion. This figure is based on historical research. Sean Fisher is the grandson of Mel Fisher, famous American shipwreck hunter who discovered the Spanish galleon Nuestra Señora de Atocha. Sean Fisher says, “Several wrecks out there are worth several billion dollars each.” Spanish vessels kept records in triplicate, which allows shipwreck hunters to see the preserved ship manifests. These manifests document an incredible amount of wealth crossing the ocean centuries ago. Although there is a significant amount of unrecovered shipwreck treasure, there are laws and jurisdiction which dictate its ownership. Global laws are emerging that concern archaeological and/or historically valuable finds. So, even if you are lucky enough to locate a shipwreck, the cargo may be sovereign property of its origin country. This scenario played out recently when American treasure hunters recovered $500 million in silver and gold coins that went down with a Spanish warship. The Spanish government won legal rights to the loot, with zero compensation to the treasure hunters. State and international maritime laws are not uniform; therefore, it is the responsibility of the detectorist to research laws of ownership prior to any recovery effort. In many cases, the salvors are entitled to the full value of their finds. 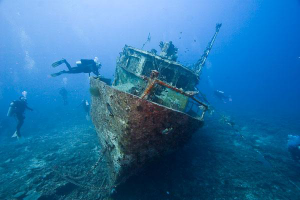 Because of legal complexities, it is often a good idea to join a dive club if you are serious about shipwreck diving. After the salvor or salvage team has carefully researched and mapped out a location, underwater detection devices are used to map the seafloor and search for wreckage. 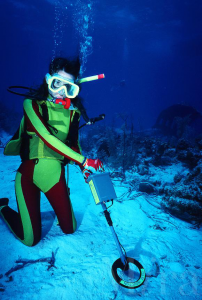 Underwater equipment typically includes boat-towed metal detectors, magnetometers, ROVs, lighting and camera/video devices, pingers and receivers; and hand-held underwater metal detectors. Boat-towed metal detectors are usually the first devices used for locating a shipwreck. They are built with long cables that are dropped from a search vessel; they will signal metal targets along a wide search area. Boat-towed metal detectors are searching for a ‘debris field,’ which can consist of cannons, anchors, propellers, a ship hull or other signs of wreckage. Underwater metal detectors are equipped with magnetometers or side-scan sonar. Magnetometers are the most powerful boat-towed metal detectors for iron and steel. They compare the intensity and direction of one magnetic field to another. Side scan sonar creates a map of the sea floor using echoes. The echoes translate into a picture—which is made up of dark and light areas. Studying these images, scientists can create accurate maps. Images of unnatural shapes such as straight edges or perfect circles require closer inspection with remote-operated vehicles and cameras. A remotely operated vehicle (ROV) is an unmanned underwater robot that transmits signals between an operator on the ship and the unit. The vehicle is navigated from the ship, but operates alone as it can travel to depths that are unsafe for humans. Typically, ROVs include a video camera, lights and sonar systems. Some are outfitted with an articulating arm that can retrieve small objects and attach lifting hooks to larger objects so they can be raised. Take the time to read more detailed information about necessary equipment for locating a shipwreck. Popular Mechanics.com- What’s the Total Value of the World’s Sunken Treasure?